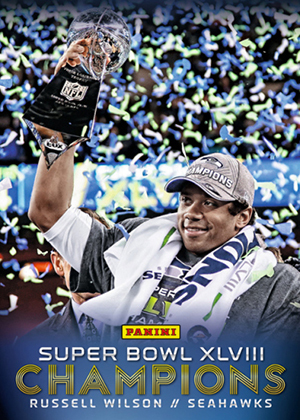 2014 Panini Super Bowl XLVIII Champions is a small factory set that commemorates the Seattle Seahawks' first championship. Consisting of 18 cards, it includes the first NFL card of Malcolm Smith, the game's MVP. Other cards highlight key players like Russell Wilson, Marshawn Lynch, Richard Sherman and Earl Thomas. Separate cards are dedicated to key moments in the game itself as well as key components to the Seahawks' success, such as the Legion of Boom. The basic player cards, which make up the first half of the set, are similar in design to the Super Bowl XLVIII Collection cards sold in the New York-New Jersey area in the days leading up to the game. 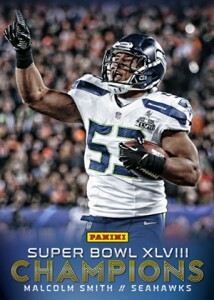 However, the 2014 Panini Super Bowl XLVIII Champions cards can be differentiated by the addition of "Champions" to the front. 2014 Panini Super Bowl XLVIII Champions sets are sold via blister pack.